Like it or not, the ship's class dining system still exists, which means those cruisers staying in non-suites are allocated to the Britannia Restaurant or Britannia Club, while suite-class passengers eat their meals in either the Princess or Queens Grill restaurants. If suite passengers would like to experience the Britannia Restaurant, it is possible, upon request. We found that while dining options onboard cover all tastes and requirements, food is hit and miss in the main dining room. It lacked in quality and culinary flair. Dishes were often overcooked, and as a result, they were short on flavor and texture. Vegetables tended to be overcooked, and some elements of a dish, such as a potato dauphinoise on one occasion, had dried out because of overheating. Health-conscious passengers are well catered for, however, with Canyon Ranch healthy options listed on the main dining room and Grills menus. Specialty dining in the Kings Court buffet offers excellent value for money, with a daily changing themed menu keeping the options fresh. The Verandah steakhouse restaurant offers passengers a prix fixe fine dining experience reminiscent of a Michelin-starred restaurant. Although predominantly a lounge bar, Carinthia Lounge offers an epicurean selection of dishes not to be missed at breakfast and lunchtime. Vegetarian options are available on all menus, although some are more limited than others, particularly in The Verandah. While all dietary requirements can be catered for, it is advisable to contact the line to make any requirements known ahead of sailing. Kings Court Buffet (Deck 7): The ship's extensive buffet is open on a nearly continuous basis, offering Continental breakfast (5 to 6:30 a.m.), full breakfast (6:30 to 11 a.m.), lunch (11:30 a.m. to 3 p.m.), afternoon snacks (3:30 to 5:30 p.m.), dinner (6 to 10:30 p.m.) and late snacks (11 p.m. to 2 a.m.). Transformed during the ship's refit -- with two central elevators removed to make way for an additional serving station -- the space is ultra-stylish and has a chic city canteen feel. It seats passengers at a mix of tall tables with stools and two-, four- and six-seat tables. In keeping with the ship's ambiance, the design features on-trend Art Deco-style floor tiles and gold lamps hanging over the food stations. We enjoyed the food at Kings Court; it felt diverse, with a balance of staple dishes like chicken, steak and salmon, complemented with more unique dishes, such as a fall-off-the-bone lamb shank and baby back ribs. The cheese station was impressive -- and far better than the cheese board served in the Britannia Restaurant -- including several different types of cheese, chutneys, crackers and accompaniments like a selection of nuts. Desserts at lunch and dinner usually include selections of dishes such as tiramisu, chocolate mousse cake and cheesecakes, along with one hot dessert. Think Bakewell slices (a traditional British pastry-based dessert consisting of a cherry base, a light sponge filling and an almond-flaked top) and custard. There are three self-service ice cream machines offering vanilla and chocolate soft serve in Kings Court. Tip: Don't pull down on the ice cream lever with too much force; it can get messy! Cones are also provided. During busier periods, it can sometimes be difficult to find a free table in the Kings Court -- particularly a window seat. Despite occasionally searching for a free table, the space didn't feel chaotic or congested during our voyage. The only time we experienced lines at the food stations was at lunch during one particular sea day when the chefs prepared several stations' worth of desserts that included fancy cupcakes, pastries and fondue. Waiters are quick to attend to drink orders at the tables. Cutlery is neatly wrapped in cloth napkins, and both Wedgwood mugs and disposable cups are provided at the self-service drinks stations. Breakfast includes fruit, cereal, pastries, cold meats and cheeses, smoked salmon, a range of breads and hot items, such as eggs cooked to order, two different types of sausages, back and streaky bacon, baked beans, black pudding, hash browns and sweeter dishes like pancakes with maple syrup. Lunch includes salads, pastas, tiger prawns, smoked salmon, cheeses and meats, pizza, different types of fish and roasted dishes like beef and pork, complemented by items such as burgers and hotdogs in the Chef's Galley. A similar offering is available in the evening, with a range of cold meats and cheeses, made-to-order pizzas in the Chef's Galley, salads (smoked chicken, Waldorf and orzo), steamed vegetables and usually two types of potato dishes, along with a selection of cooked meats and fish selections. Complimentary drinks in the Kings Court include a selection of Twining teas, coffee, water and fruit juices (cranberry, pineapple, apple and orange). The beverage menu allows passengers to order soda, beer, wine and spirits, too. Britannia Restaurant (Decks 2 & 3): The Britannia Restaurant is the largest of the ship's main dining rooms, serving breakfast (8 to 9:30 a.m.), lunch (noon to 1:30 p.m.) and two dinner sittings (6 p.m., with last orders at 6:30 p.m., and 8:30 p.m., with last orders at 9 p.m.). The restaurant features a range of table sizes that accommodate from two to 10 people. Two-seat tables are more limited and often get booked up in advance. (Passengers can request a specific table size pre-cruise.) Tables are fixed, too, so diners sit at the same table with the same tablemates each day. Britannia Restaurant is iconic. From the towering fabric Queen Mary memorial in the background to the stained-glass internal domed roof and sweeping staircases, the restaurant retains all of the glamor that is reminiscent of the Art Deco period. The room fills with energy during the evenings, and, particularly on formal nights, it has a fantastic atmosphere. The breakfast menu is traditional, starting with a chilled juice followed by fresh fruit, compote and yogurt, hot and cold cereal, fresh bakery items and assorted cold cuts and cheeses. This selection is followed by a "main course" of Cunard's Get Up and Go Signature Plate, featuring eggs with smoked salmon and chives, bacon, sausage, hash browns, black pudding, tomato and sauteed mushrooms. There is also a selection of other breakfast entrees, including eggs cooked to order, a variety of omelets, additional sides, pancakes and waffles. The lunch menu includes a selection of appetizers, salads and sandwiches, entrees and desserts. Typical dishes include spaghetti carbonara or grilled swordfish steak. Dinner service includes six appetizers, six entrees and six dessert options. On our voyage, starters included dishes such as beef consomme, frog legs and a mushroom feuillete with a mascarpone and herb cream sauce, followed by a salad course. Entrees included chicken curry, roasted rack of spring lamb and fillet of haddock. Vegetarian dishes -- usually two per menu -- might include vegetable moussaka and a potato pancake with Quorn croutons and bean cassoulet. The dessert menu features classics like caramelized pears, chocolate fondant and dulce de leche. There's always a cheese board featured among the dessert options -- although we found it a poor choice -- and there's also a spa selection of low-calorie dishes. While service in the Britannia Restaurant was generally very good -- our servers were professional and charismatic -- the food was generally subpar. Dishes felt mass produced, and there appeared to be a lack of quality control. For example, the quality of the cheese board deteriorated during the voyage. Britannia Club Restaurant (Deck 2): Serving the same menu as the Britannia Restaurant, but set off in a smaller, more intimate area, Britannia Club passengers can dine from 8 to 9:30 a.m. for breakfast, noon to 1:30 p.m. for lunch and anytime between 6:30 and 9 p.m. for dinner, giving passengers flexible dining times in the evening. Princess Grill (Deck 7): Breakfast (8 to 9:30 a.m.), lunch (noon to 1:30 p.m.) and dinner (6:30 to 9 p.m.) is served in the Princess Grill for Princess Grill suite passengers only. Lunch options include a selection of low-calorie Canyon Ranch Spa dishes, such as a cream of tomato soup followed by a chicken meatball sandwich and finished with a fruit plate. The regular menu starts with appetizers and soups, followed by salad and sandwich options, entrees and desserts. Typical dishes include grilled pork cutlet with horseradish mash, wild mushrooms and a Madeira sauce or a pasta dish with arugula, sun-dried tomatoes and a chicken sauce. Two menus are available in the evening -- the Dinner and A La Carte -- allowing Grills passengers more choice. Appetizers include dishes such as zucchini and goat cheese tart and terrine of ham knuckle. This is followed by a salad and a selection of entrees, such as Scandinavian arctic char, New York strip steak au poivre or caraway-roasted pumpkin risotto. There's also a daily Cunard Signature Classic dish, which must be ordered by lunch on the same day. On our sailing, this included a Dover sole meuniere. Typical desserts include parfaits, panna cottas and souffles, and for those who have saved space, the cheese trolley is presented at the end. Food is notably improved in the Princess Grill, with ingredients of a better quality and dishes that are more creative. Queens Grill (Deck 7): Breakfast (8 to 9:30 a.m.), lunch (noon to 1:30 p.m.) and dinner (6:30 to 9 p.m.) are served in the Queens Grill for Queens Grill suite passengers only. Queens Grill, which has the feel of a private club restaurant, has extra tables for two for those who prefer to dine as a couple. The menu works in the same way as in the Princess Grill. Breakfast flows with several courses, including fresh fruit, cereal, yogurt and smoothies and bakery items to start, with a choice of pancakes and waffles and/or a breakfast entree dish to follow. Entree dishes range from a full English or American breakfast to a more extravagant petit fillet mignon with fried eggs and hash brown potatoes. Lunch includes a three-course Canyon Ranch option plus a series of appetizers and soups, salads and sandwiches, entrees and desserts. Typical dishes include an avocado and grapefruit cocktail and a broiled ocean perch with sauteed spinach. Typical dinner dishes include quail breast saltimbocca, crawfish salad and roasted pumpkin veloute to start, followed by a salad and a selection of entrees. Entrees include dishes such as fillet of hake with a sweet corn risotto; rack of Romney Marsh lamb; and usually at least one dish designed for sharing, such as the chateaubriand. Desserts include several options, from the fruity to the chocolatey. This is all rounded off by a cheese trolley. Better quality ingredients, improved cooking techniques and the clever pairing of ingredients make this one of the most refined restaurants onboard. Boardwalk Cafe (Deck 12): The ship's fast food restaurant on Deck 12, by the Kennel Suite, serves burgers, fries, hotdogs and soft drinks, but has no seating, and, as a result, is weather-dependent. Opening times vary; we didn't see it open once on our sailing. 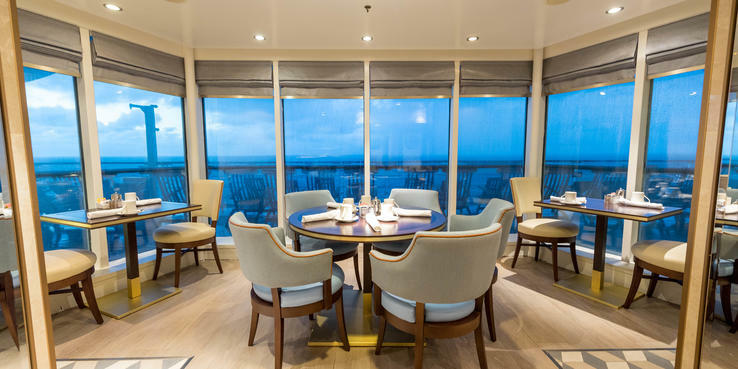 Carinthia Lounge (Deck 7): The ship's Carinthia Lounge, which was added during the 2016 refit, isn't just a stylish space to meet with friends or enjoy a drink. It also serves some of the tastiest dishes on the ship. We often opted for the Carinthia Lounge for breakfast (8 to 10 a.m.) or lunch (noon to 2:30 p.m.) as an alternative to Kings Court because of its small gourmet plates. Feast over a delicious breaded haggis ball or a gooey fried egg over spicy sauteed mushrooms and tomatoes. There are also classic eggs Florentine and breakfast panini, as well as a range of gourmet pastries, yogurt and granola pots available. At lunchtime, passengers can graze on an equally appetizing selection of plates, including an addictive pulled barbecue beef flatbread; chicken, asparagus, mushroom and Gruyere cheese savory crepes; a charcuterie platter and club sandwich, among other dishes, with a selection of eclairs and cheesecake pots for after. All dishes are freshly prepared by the chefs behind the counter. Queens Room (Deck 3): A signature Cunard service is the line's afternoon tea offering, which is served in the ship's Queens Room. Served daily (3:30 to 4:30 p.m.) to the backdrop of classical music, the traditional afternoon tea includes a selection of fine leaf teas, finger sandwiches, pastries and freshly baked scones with clotted cream and fruit preserves. Golden Lion (Deck 2): The Golden Lion serves pub lunches (noon to 3 p.m.) with a menu that features dishes such as cottage pie, fish 'n' chips and other British pub classics. Room Service: Twenty-four-hour room service is available to all cabins. The menu is varied with two salad options, one soup, sandwiches, a varied selection of hot dishes, hot sandwiches, burgers and desserts. The room service menu also has a limited number of vegetarian options, with five of the 18 savory dishes listed suitable for vegetarians. A service charge is not applied to food orders. Although our room service arrived on time, the experience was hit and miss. The pizza and pulled pork tacos were lovely, but on another occasion, the toast we ordered to accompany our breakfast was forgotten. On still another occasion, the Mediterranean frittata we selected arrived as an unappetizing and soupy mess, made with a poached egg on top instead of scrambled egg throughout. When we called to order a replacement, we added bacon and were told it's not normally available for brunch, which we found strange. Kings Court Specialty A La Carte (Deck 7); $17.50: Between 7 and 9 p.m., a section of the Kings Court is transformed into a specialty dining venue. Every night is a different theme: Aztec, offering regional Mexican cuisine; La Pizza, which is a celebration of Italian cuisine; Bamboo, a Pan-Asian theme drawing on Japanese, Singaporean, Indonesian, Thai and Chinese cuisines; Coriander, focusing on Indian regional cuisines; and the brand-new Smokehouse, featuring classic American barbecued dishes. Expect dishes such as buffalo chicken wings and Maryland crab cakes to start and coconut-crusted shrimp or buttermilk southern fried chicken and mac 'n' cheese on the Smokehouse menu. Each individual menu also features a tailored selection of drinks. For example, the Smokehouse's menu plays on American wines and beers, while Coriander's drink menu features international wines -- including some Indian choices -- and Indian beer. Kings Court Specialty A La Carte offers great value for money; as testimony to its popularity, it was fully booked on every night of our voyage. The Verandah (Deck 8); $20 for lunch, $49.95 for dinner: This elegant steakhouse is a nod to America's love for all things meat. Elegant but plush surroundings set a tone of decadence, which begins with delicious homemade pull-apart bread that's brought to the table covered in sweet butter and herbs. Next, several cuts of meat are presented and explained to diners before they order. They include several sizes of 35-day dry-aged Scotch grass-fed Black Angus, 28-day aged prime USDA grain-finished Angus and Australian grass-fed wagyu beef, as well as seafood add-ons. In terms of mains, passengers can choose from options like lobster cocktail, clam chowder or Caesar salad; entrees on offer include grilled whole Dover sole, a "Cunarder" Angus beef burger and a veggie burger; and a selection of side salads, veggies and sauces round out the offerings. Before eating, cruisers are presented with a choice of knives with which to cut their meat. The interesting part? They all have names, are made from different materials and are designed to fit different hand sizes and shapes. For dessert, try the coconut and cookie crumble topped with sorbet. Kudos to the restaurant's chefs who pack serious culinary flair into every dish. The result felt like dining in a Michelin-Starred restaurant.